← 216 "Homer to the Max"
The Simpsons sit on the couch; hair dryer helmets land on every family members’ heads. When the helmets come off, every family member has each other’s hairstyles. Maggie falls off the couch because Marge’s bouffant is too heavy to support her. "I'm with Cupid" is the fourteenth episode of season 10. It originally aired on February 14, 1999. The episode was written by Dan Greaney and directed by Bob Anderson. Elton John guest stars as himself and Jan Hooks reprises her role as Manjula Nahasapeemapetilon. "As Kwik-E-Mart convenience store proprietor Apu showers his wife with glowing, outrageous Valentine's Day gifts, the other husbands of Springfield are made to look bad in his shadow. But as his gifts grow increasingly grand, the men attempt to foil his efforts, instigating a Valentine's massacre." Apu and Manjula, invite the Simpsons to their house for dinner. However, Apu and Manjula get in a fight, after Marge mentions to Manjula that Apu does not really need to be as much of a workaholic. There is a week before Valentine's Day, and Apu tells Homer that he is disappointed that Manjula does not love him, until Homer assures him that Manjula will not leave him before Valentine's Day, and Apu agrees. Apu decides to shower Manjula with many romantic surprises to regain her love. However, although many of Apu's surprises succeed in fixing his marriage, they ruin other people's relationships. The rest of Springfield's women become disenchanted from their envy towards all the attention Manjula is receiving, and they find their men to be nothing more than cheapskates. At Moe's Tavern, several men in Springfield try to find ways to avoid having Apu and Manjula reconcile to save their own relationships and marriages. During Valentine's Day, Homer, Chief Wiggum, Dr. Hibbert, Moe, and Ned Flanders (who is later thrown out of the group for suggesting they should use their time to be more romantic to their wives rather than trying to sabotage Apu) investigate what Apu is doing so they can stop it. They go around town following him to the airport. But when they see Elton John at the airport, they think that he supposedly came to Springfield to perform a concert for Apu and Manjula at his insistence (in reality, he had to make an emergency landing because the chandelier on his plane was malfunctioning). However, Apu's actual plan is that he arranged for a skywriter to write "I ♥ U MANJULA". During the trouble that ensues, Homer jumps on the plane during takeoff to try to stop the skywriter from spraying the message. When Homer destroys the plane's canister in mid-air it only sprayed part of the message, which the other women think is for them. While Homer and the pilot fight, Marge remains unconvinced until the plane flies by and Homer drops out of it covered with roses after the plane flew out of control through a thorny rose patch, apparently giving Homer a collapsed lung. 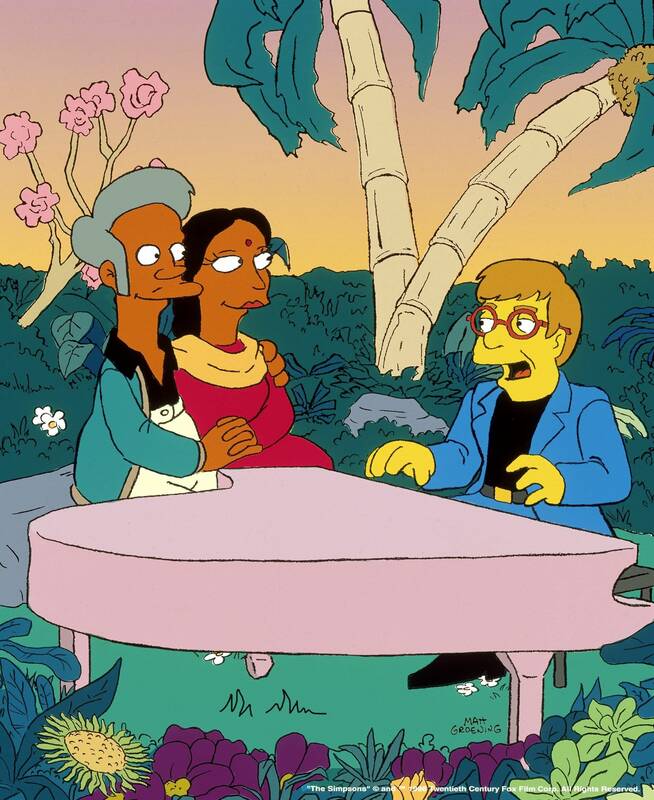 Nonetheless, Elton John is able to perform a concert for Apu and Manjula, and their marriage is saved. Robert Canning gave the episode a 8.8 saying it was "great" and "But aside from this, the episode is very smart and very funny. It ends with Homer fighting the skywriter in the air to prevent the message from being written. The result was a note in the sky that the women of Springfield all interpreted as being for them from their significant other. And Homer stumbles into a heartwarming romantic gesture as his fight with the pilot results in him falling from the sky throwing roses at Marge's feet. In this tightly written Valentine's episode, everybody gets a happy ending.". Colin Jacobson of DVD Movie guide said "Didn’t we already see that Flanders makes everyone else look like a jerk on Valentine’s Day? Doesn’t that theme mean that “Cupid” is somewhat redundant? Not that the show lacks any spark, as it throws out a reasonable number of laughs. Still, it seems a little stale and not one of the year’s better programs.". Modified on February 15, 2016, at 19:47.